As Manufacturing Demand Grows, So Do Jobs Companies, especially those in the manufacturing sector, are hiring at a pace that is likely to bring down the unemployment rate at a gradual rate. The unemployment problem is far from over, but a factory outside Boston is feeling the benefits of increased orders. Joe Pelton operates a computer-controlled machine that drills a tiny hole into a needle that is used to make microchips. 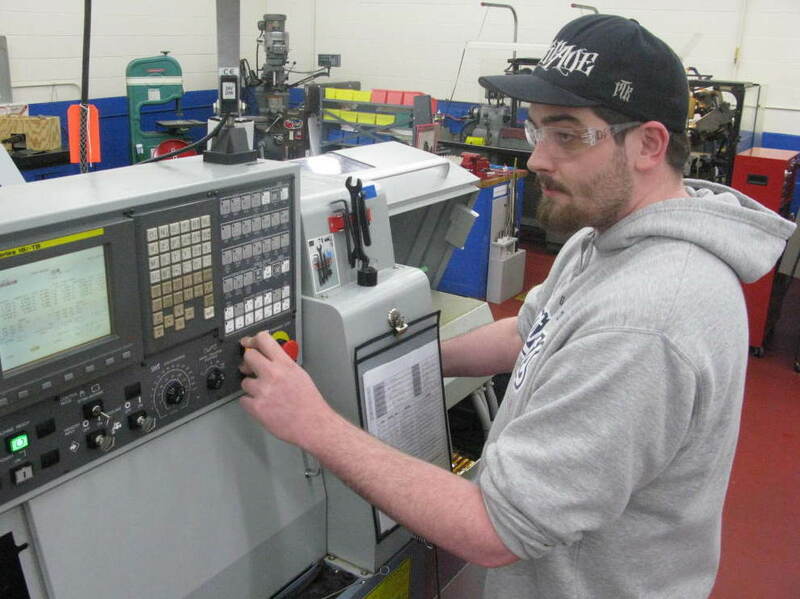 He works at AccuRounds, an advanced manufacturing facility in Avon, Mass. It would be easy to think that factory work is slowly disappearing in this country. But there have been steady job gains recently: Just last month, manufacturing created 33,000 jobs, according to the Labor Department. AccuRounds, an advanced manufacturing facility in Avon, Mass., makes a broad range of precision-tooled metal parts. All of the parts it makes are round or cylindrical. The company makes metal posts for replacement teeth and dental crowns, parts for robots, and tubes for making flu vaccines. It also manufactures needles with tiny holes that are smaller than a human hair, which are used to make computer circuit boards. By looking at the factory's orders, Patrick O'Connell, AccuRounds vice president of operations, can see what kinds of companies are experiencing an uptick in business. "The semiconductor sector — we've seen a big pickup over the past three months," he says. "It's very encouraging: AccuRounds just hired three more workers in recent days." This latest jobs report actually showed pretty strong growth across most industries, which is encouraging to economists. Nariman Behravesh, chief economist at IHS Global Insight, says the 192,000 jobs added in February amount to some pretty solid job growth. That's on top of the upward revisions to previous months' payrolls. By averaging the last three months' job growth, he says, the private sector is adding 150,000 jobs per month and picking up steam. "Finally, finally the recovery seems to be reaching the jobs market," Behravesh says. Austan Goolsbee, President Obama's top economic adviser, was with the president when he got news of this latest round of jobs numbers. "Well, you know, he was happy — I got a fist bump," Goolsbee said. Goolsbee has been watching the unemployment rate fall sharply this winter — from up near 10 percent to 8.9 percent. "This three-month drop from 9.8 [percent] is the biggest three-month drop in 27 years, and that's clearly the right way we want to be moving," he says. It doesn't mean the unemployment problem is over. But companies are hiring at a pace that should continue to bring down unemployment slowly. Behravesh says he only expects the rate to fall to around 8 percent by the end of the year. Meanwhile, there are still 6 million Americans who have been out of work for more than six months. Computer-controlled-machine operator Richard Rogers is one of the workers at AccuRounds who were hired in recent months. Before that he was out of work for two years. But he was enrolled in school during one of those years. Rogers ended up going to community college in Connecticut to get the kind of training he needed to land a job in a high-tech factory. Meanwhile, he was struggling to help put two kids through college. Rogers, 60, says it was hard not to get pessimistic: "My biggest fear was finding someone who would hire me at my age. I'm not a young man and it's tough. It took me a while, but I got a good education and just started applying." Millions of other Americans wish they were so lucky. For now, there are still nearly 14 million unemployed workers who are looking for jobs.